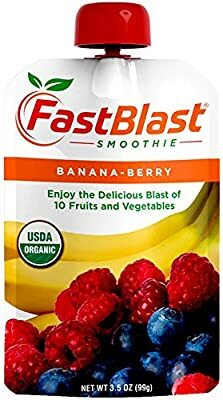 FastBlast - Banana - Berry Smoothie - Loaded with Antioxidants, Phytonutriets, Vitamins and Minerals Formulated to Control Appetite and Maintains Energy - 100% Organic, Vegan and Sugar Free. 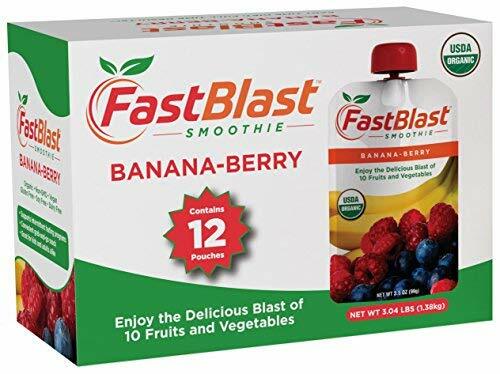 The FastBlast Banana-Berry Smoothie is the first and only product specifically formulated to support intermittent fasting with limited caloric intake. It provides optimal nutrition by utilizing a perfect balance of organic protein, carbohydrates and healthy fat that help curb your appetite and cravings—all delivered in a convenient squeeze pouch. Loaded with antioxidants, phytonutrients, vitamins and minerals, our all organic Banana-Berry Smoothie features ten fruits and vegetables including a fermented blend of blueberry, carrot, cranberry, apple, broccoli, parsley, spinach and kale along with banana and raspberry. FastBlast any two days a week while still enjoying the foods you love the rest of the time. Where many diets complicate your life with planning meals, purchasing ingredients, preparing, cooking and cleaning up; our go-anywhere FastBlast smoothies are convenient and easy to use. Just twist off the top, squeeze and enjoy. 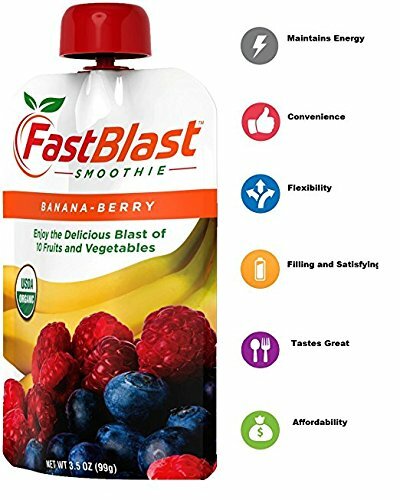 FastBlast Smoothies are specifically formulated to control your appetite and leave you feeling full and satisfied for hours. 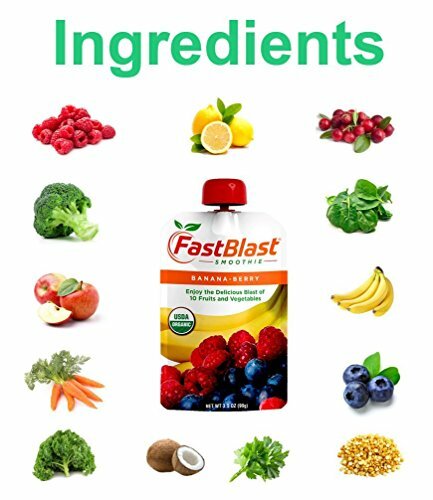 FastBlast Smoothies maintain your energy by blasting your cells with high quality nutrition like organic fermented fruits and vegetables, organic pea protein and coconut cream. No need to follow a diet of bland foods that you don’t like and would never eat. FastBlast Banana-Berry Smoothies are so creamy and delicious you will look forward to every serving. Experience the Great Taste Any Time... Anywhere! SUPPORTS INTERMITTENT FASTING - Specifically formulated to control your appetite and leave you feeling full and satisfied for hours.Convenient and easy to use. 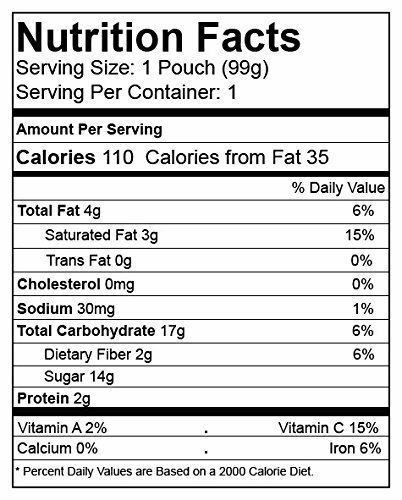 Just twist off the top, squeeze and enjoy.Enjoy limited calorie intake, watch your weight, stay fit and healthy without starving at all. GOES EVERYWHERE YOU GO - All of our banana berry smoothies come in ergonomic and convenient squeeze pouches. When it's lunch time, get a smoothie pouch, remove the cap and enjoy.Smoothies are perfect for your active and on-the-go lifestyle. LONG LASTING RESULTS - FastBlast guarantees part time diet with full time results. Now you can FastBlast any two days of the week while still enjoying the foods you love the rest of the time. PACKED WITH THE ABSOLUTE ESSENTIALS - FastBlast Smoothies maintain your energy by blasting your cells. Each smoothie is packed with high quality nutritional ingredients like organic fermented fruits and vegetables, minerals, fibers, organic pea protein, and coconut cream. GET THIS BANANA BERRY SMOOTHIE RISK FREE - 100% Organic, non-GMO, Vegan, Gluten, Soy and Sugar free.The perfect energy supplement for athletes, active moms, students, and everyone.